This article traces current and emerging themes from Buddhist philosophy and psychology that have increasingly appeared in western cognitive psychotherapeutic practices. We argue that this interest has occurred within the context of post-modernist, relativistic thinking patterns first exemplified by the constructivistic movement within cognitive psychotherapy. This in turn has arisen from a world-wide clash of cultures in which western cognitive psychotherapies have been forced to reconsider some of their own tacit assumptions. Ideas for the future development of cognitive psychotherapies using Buddhist and Eastern ways of thinking are presented. Key words: cognitive-behavior therapy, Buddhism. This article is based on an Invited Address by the first author at the 2005 Congress of the International Association for Cognitive Psychotherapy, Gothenburg, Sweden. The purpose of this article is to trace the development of cognitive psychotherapy as it has increasingly incorporated constructivistist and relativistic themes which are based in part on Eastern ways of thinking. First, we examine the role that Culture – our own and that of others – plays in the cognitive psychotherapy process. Second, we examine the theoretical and practical influence of Buddhist concepts on Western cognitive psychotherapy, and end with some recommendations for further incorporation of Buddhist concepts and practices. Cognitive psychotherapy, like other forms of therapy, is deeply embedded in the culture in which it has developed and uses existing cultural metaphors to explain its interventions and anticipated outcomes. Because these metaphors were developed within Western ways of thinking, they included certain cultural tacit assumptions and concepts and excluded others. The great error in the creation of all systems of therapy has been to postulate universals where there are really cultural specifics. Thus Freud’s world view was a product of the 19th century Central European culture with its suppression and channeling of sexual activities, and its use of the principles of hydraulics and mechanics in developing such concepts as drive reduction and symptom substitution. Later, Carl Rogers’s (1961) client-centered therapy can be seen as reflecting two powerful cultural aspects of mid-20th century American life: the increasing egalitarianism that reduced the exalted status of the therapist and the increasing affluence in material goods as well as the reduced hours of work that permitted the leisurely exploration of the client’s inner mental life. Heinz Kohut (1985), who developed self psychology, thought the ideal type of individual identity was the autonomous self, characterized by self-esteem and self-confidence. Cushman (1995) refers to this as the creation of the “masterful, bounded, feeling Self” of the post-World War II Western era. The central role of the therapist for Kohut was building, maintaining, and enhancing the patient’s self-identity, separate from that of others. But Cushman sees this as an “empty self” that must be filled by consuming material possessions. Behavior therapy’s guiding metaphor can be seen as that of the machine and a mechanized view of therapy, with one early article even referring to the behavior therapist as a “reinforcement machine.” Early cognitive psychotherapy (broadly considered) appears to have been based on an information processing metaphor, with the tacit assumption that reality is fixed and the objective of therapy is to change dysfunctional, unrealistic cognitions into more adaptive, realistic ones. With the exception of client-centered therapy, there is little room in these cultural assumptions for such Buddhist concepts as compassion except at the most basic level of trying to help people. The therapist is a change agent, not a caring agent. Tacit cultural assumptions change, sometimes rapidly, when a culture comes in close contact with, and often in opposition to, another culture. This has been especially true in recent years with increasingly rapid communication and transportation around the world. The resulting “clash of cultures” can be profoundly unsettling and upsetting to people in both cultures, as each tries to argue for and sometimes force its concepts of goodness, morality, and other cultural assumptions on the other. The intermingling that results can be gentle or it can be harsh. But both cultures are changed in the process, although not necessarily to the same degree. Cultural assumptions are examples of tacit or implicit knowledge structures that are developed automatically at an early age. Thereafter these assumptions or “rules for living” become a template or a cognitive filter which acts to screen out discrepant data and screen in confirming data, resulting in a self-fulfilling prophecy. Because these tacit cognitions are largely preverbal, they cannot easily be discussed because we have no words for them. We often respond when these tacit assumptions are questioned with: “But that’s just the way things are! That’s just reality! Everyone knows that!” In other words, we find what we expect to find and we see what we want to see. Thus, rather than “seeing is believing,” a more accurate phrase might be “believing is seeing.” Those who practice cognitive therapy refer to these tacit knowledge structures as “core cognitive schemas” (Dowd, 2004) or “early maladaptive schemas” (Young, Klosko, & Weishaar, 2003); within the context of cognitive hypnotherapy they are referred to as “cognitive structures” (Dowd, 2000). At the individual level, a serious and massive assault on core cognitive schemas or structures can lead to a profound psychological crisis, with feelings of depersonalization and disorientation. The movement in cognitive psychotherapy towards a more constructivistic approach is in many ways a profound change from earlier models and may have been caused, at least in part, by the “clash of cultures” as more Eastern ways of thinking began invading the West. Early cognitive psychotherapy may have created a few universal assumptions of its own where there are really cultural specifics, such as the veridical nature of irrational thoughts or cognitive distortions. Constructivistic psychotherapy differs in significant ways from earlier forms of cognitive psychotherapy. Its major point of difference is that it assumes reality is not fixed or “out there to be discovered;” it contends that humans have no direct access to a reality beyond their own cognitive constructions and consequently they create their own reality. Therefore, one person’s “reality” may be different from another person’s “reality,” based on their different culture and values, and it makes little sense to try to determine whether their thoughts are “distorted” or “irrational” in the abstract. People’s values and cultural assumptions even determine the kind of questions they ask or the type of data they accept. Constructivism encourages people to think in terms of “both/and,” rather than “either/or.” Moreover, constructivism discourages strict linear, causal thinking (e.g. “A causes B which causes C”) and encourages a more circular, contextual way of thinking in which everything causes everything else and everything is embedded within a particular context. Thus, knowledge gained may not easily translate from one context to another. Although these are often difficult concepts for the Western mind to understand, some of these Eastern themes and ways of thinking have already crept into cognitive psychotherapy. We first examine the role of compassion. “a state of mind that is non-violent, nonharming, and nonaggressive. It is a mental attitude based on the wish for others to be free of their suffering and is associated with a sense of commitment, responsibility, and respect towards the other… In developing compassion, perhaps one could begin with the wish that oneself be free of suffering, and then take that natural feeling towards oneself and cultivate it, enhance it, and extend it out to include and embrace others.” (Dalai Lama & Cutler, 1998, p. 114). Later they define compassion as “the feeling of unbearableness at the sight of other people’s suffering…” (p. 116). In other words, it is both a profound understanding and a call to action. Empathy, on the other hand, has been defined by Prochaska and Norcross (2003) as sensing someone else’s “private world as if it were our own, without our own anger, fear, or confusion getting bound up in the experience.” (p. 148). In other words, one understands another person as profoundly and as accurately as possible but there is not necessarily a further action required. There is obviously conceptual overlap between these two definitions but there are some important differences. There is an interconnected quality among all people implicit in compassion but a more individual, one-on-one quality in empathy. Gilbert (1989) has described Buddhist psychology as involving a sense of “we-ness” and connectedness with all sentient beings. Empathy of course can help us to be compassionate but it is in the service of compassion; it is not compassion itself. There is also a profound understanding of the nature and the commonness of human suffering in compassion, perhaps one of the most important Buddhist teachings, and it is the first of the Buddha’s Four Noble Truths. In fact, we would argue that the very call to action implicit in compassion is a result of the understanding of the nature of human suffering. Gilbert (1989) again suggests that the care-giving mentality is behind compassion. We cannot simply allow ourselves and others to suffer without trying to do something about it! What are some themes of compassion that might be found in cognitive psychotherapy, although not necessarily by that name? Early on, Alfred Adler came reasonably close to compassion in his concept of “Gemeinschaftsgefühl” (Adler, 1939). It was translated into English as “Social Interest” but a more accurate translation might be, “feelings for the (small) community.” Later Albert Ellis (cf Ellis & Dryden, 1997) essentially incorporated the Buddhist concept of Acceptance in his emphasis on non-demanding and preferential thinking as an alternative to absolutist and demanding thinking and low frustration tolerance in fostering emotional health. Michael Mahoney (2003) in describing “Constructive Psychotherapy” (a latter-day outgrowth of cognitive therapy) says that the compassionate relationship and caring are the heart of psychotherapy. This caring can, of course, be demonstrated by empathy. He goes on to say that collaboration and action are the result of this compassion and caring. The emphasis on the importance of the therapeutic relationship is not new. Carl Rogers, one of the first psychologists to investigate scientifically the psychotherapy process and outcome, considered it to be the basic healing power leading to therapeutic change (Rogers, 1961). He thought accurate empathy was one of the three core conditions of effective psychotherapy. More recently, David Shapiro and his colleagues in the Sheffield Psychotherapy Research Project in England (Hardy et al., 1998), and Adam Horvath (2000) and Daniel Martin (2000) and colleagues in the USA, have found the therapeutic alliance (a relationship variable) to be about as robust a phenomenon accounting for therapeutic change as we are likely to find in psychotherapy research. The therapeutic alliance is implicitly based upon understanding, empathy, caring, and compassion. Certainly, the more we understand about someone, the more caring and compassionate it is possible to be. In early cognitive therapy, this alliance was perhaps best described as “collaborative empiricism,” in which the therapist and client worked together to understand the client’s cognitive biases and then change them based on an examination of the evidence for the client’s existing cognitive assumptions. Aaron T. Beck, in his book entitled “Prisoners of hate” (Beck, 1999), has written of people’s need to overcome their egocentricity, narcissism, and hostility and to treat each other with humanistic altruism. Too often, the ingroup-outgroup way of thinking restricts our compassion to members of our own (presumably superior) group. Compassion may be especially useful in overcoming problems of anger and hostility, but it was not mentioned in a recent review by Deffenbacher, Oetting, and DiGiuseppe (2002) of empirically supported anger management interventions. Overcoming anger is, however, an important aspect of Buddhist teaching and practice (Nhat Hanh, 2001). Recently, however, Dowd (2006) combined Buddhist concepts of compassion, acceptance of negative emotions (including suffering), the negation of the Self and its demands, the reduction of desire and attachment and their demands, and the emphasis on relaxation by meditation with more standard cognitive behavioral treatments in a case example of the hypnotherapeutic treatment of anger and hostility. Other Buddhist themes are more directly and explicitly incorporated in Hayes’ and colleagues edited book, “Mindfulness and acceptance: Expanding the cognitive behavioral tradition” (2004). Essentially, Hayes et al. incorporated into CBT aspects of Buddhist thought and meditation, paradoxical interventions, contextualism (e.g., constructivism and hermeneutics), Korzybski’s Theory of General Semantics (REF), and experiential therapy. Not all of these influences are explicitly acknowledged in the book, but they implicitly pervade it. The book fits well into the emerging American cultural “Zeitgeist”, which has itself become more relativist and contextual. As Hayes et al. note in the introductory chapter, “Assumptions about the questions, issues, methods, and forms of evidence appropriate to a field are often more important to maintaining a dominant paradigm than are specific theories, studies, principles, or technologies” (p. 4). Hayes refers to these new behavior therapies as defined by three aspects; 1) less reliance on first-order change (although that term is not defined), 2) a more contextualistic approach, and 3) a broadening of the focus of change. In addition, Hayes stresses the function of behavior, not necessarily the form of behavior and encourages clients to live according to their values, rather than pursuing “truth.” Relativism is the hallmark here, as it is increasingly in contemporary American society. The one concept however which seems to permeate the book is acceptance; but what do the chapter authors mean by acceptance? There seem to be several aspects to it. First, there is an acceptance of what one is, as part of the change process, echoing the Alcoholics Anonymous slogan, “To change what we can change, to accept what we cannot change…” (AA Services, 2001). Embedded in this is the acceptance of suffering as inevitably a part of life, a Buddhist concept for centuries. Indeed, as Hayes et al. (1999) said, “Humans as a species are suffering creatures” (p. 3). This is not necessarily bad, considering that the Dalai Lama said that an appreciation of suffering is the first step in generating compassion. The idea is to refrain from attempts to control this distress. This is similar to the Third Noble Truth, that suffering can be eliminated, or at least reduced, by rejecting and letting go of desire. Along with this is letting go of self-serving, self-enhancing illusions about ourselves. Second, there is a strong advocacy of acting and thinking in the Present, the Now. Third, there is an emphasis on mindfulness (full awareness of what one is experiencing, contacting, seeing, hearing, etc.) as a means to acceptance. A cynic might claim that, since we have discovered we often cannot assist our clients to change, we might as well help them to accept themselves the way they are. But there is more to it than that. Acceptance can be truly transformational in our lives, rather than conservational. It is an opening up to new possibilities rather than holding on to what we have. It is really a second order change strategy. We continue our discussion of first- and second-order change strategies in the next section. There is a fundamental difference, however, between a Buddhist approach to change and that of cognitive psychotherapy. David (2003) has noted that both Buddhist philosophy and cognitive psychotherapy emphasize that it is the evaluation of our experiences that are paramount in determining our responses to events rather than the experiences themselves. However, while cognitive psychotherapy focuses on changing these evaluations, Buddhism focuses on reducing or eliminating our expectations and desires, thus decreasing the impact of these events in our lives. The difference is between changing and letting go. The influence of Buddhist philosophy on cognitive psychotherapy is perhaps most apparent when one considers “third-wave” psychotherapies such as Acceptance and Commitment Therapy, Mindfulness-Based Cognitive Therapy, and Dialectical Behavior Therapy Interestingly, these therapies have demonstrated effectiveness for psychological disturbances in which conventional psychotherapies have had limited success, such as borderline personality disorder and recurrent depression. Acceptance and Commitment Therapy (ACT), as developed by Hayes and Colleagues (Hayes, Strosahl, & Wilson, 1999), explicitly uses the concepts of suffering and compassion. Although the system is much too complex to describe here, we will summarize the main points. First, although our assumption is that psychological health is the natural state of people; in truth suffering is the human constant. Second, suffering occurs because of the intrusion of language into area where it is not functional. Hayes et al. argue that language only partially reflects reality, similar to Alfred Korzybski’s (1933) linguistic idea that “the map is not the territory.” Third, experiential avoidance, which occurs when people are unwilling to remain in contact with certain private experiences, is commonplace. But this avoidance is very destructive and paradoxically may lead to even more distress, a sort of rebound effect. The alternative to avoidance is acceptance – acceptance of what one is thinking, feeling, remembering, and so forth. Fourth, clients are encouraged to engage in committed action, allowing thoughts, feeling, memories to be used towards achievement of goals, not to function as obstacles. In ACT, we find echoes of paradoxical interventions and second order change, without those terms being used explicitly. ACT has been shown to be an effective treatment for a wide variety of conditions ranging from nicotine-dependence, depression, social phobia, and work-related stress (Hayes Follette, & Linehan., 2004), and has also demonstrated utility as a relapse-prevention intervention for psychotic disorders, significantly reducing the rate of rehospitalization by approximately 50% over a four-month follow-up period (Bach & Hayes, 2002), . Another, more explicit, example of the incorporation of Buddhist themes into cognitive psychotherapy is Mindfulness-based cognitive therapy (MBCT), a relapse-prevention treatment developed by Segal, Williams, and Teasdale (2002) for recurrent depression which has recently been endorsed by the UK National Institute of Clinical Excellence (NICE) as an effective treatment (NICE, 2004). Segal et al. describe mindfulness itself, defined as “paying attention in a particular way on purpose, in the present moment, and non-judgmentally”, as the core skill. Other Buddhist concepts are incorporated into MBCT as well – the acceptance of the problem instead of trying to “fix it” immediately, the acceptance of negative emotions, and “decentering,” with the mental stance of non-judgementalism and acceptance of thoughts and feelings (reminiscent of the Third Noble Truth). Fresco, Segal, Buis, and Kennedy (in press) found that high post-treatment decentering offered some protection from depression relapse and led to greater treatment durability. Interestingly, decentering was a technique used in Beck’s original cognitive therapy for depression, although it was combined with distancing, as a way of cognitively and emotionally detaching from one’s problems. Fulton and Siegel (2005) posit that mindfulness acts as a form of exposure therapy, where by observing thoughts without attempting to avoid, control or change them clients becomes increasingly desensitized to their own thoughts. Dialectical Behavior Therapy (DBT) is a well-established, empirically-supported treatment for borderline personality disorder developed by Marsha Linehan (Lynch, Chapman, Rosenthal, Kuo, & Linehan, 2006; American Psychological Association, Division 12). DBT is based upon a dialectical philosophy which posits that thoughts, behaviors, and other phenomena are transformed via a process whereby the initial proposition (thesis) is met with a contradiction (antithesis) which is reconciled via synthesis of the two opposing positions. The central theme of DBT is the dialectic between the thesis of change (e.g., changing the client’s behavior or thoughts) and the antithesis of acceptance (e.g., acceptance of the client’s current and past experiences). Negotiation of this dialectic is accomplished in part via mindfulness training which incorporates “radical acceptance” and readiness to engage fully in life without attempts to change or avoid experiences. Mindfulness training in DBT has the expressed aim of development of the “wise mind”, that is, integration between the emotional and rational thought, as well as increased control over the focus of one’s attention (Lynch et al., 2006). As in MBCT, mindfulness in DBT is hypothesized to act as a form of exposure for the borderline client, where strong emotions are experienced in the absence of the typical avoidance response. However, unlike MBCT, DBT clients are asked to refrain from distancing but rather to “enter into” the experience as fully as possible (Baer, 2003; Lynch et al., 2006). Buddhist themes can be seen in the emphasis on non-linear thinking processes (“both-and” rather than “either-or”), the radical acceptance of one’s self simultaneously with the desire for change, and the emphasis on mindfulness training. The deliberate cultivation of compassion, both for oneself and for others, can be an important part of the practice of cognitive psychotherapy. An increased sense of compassion can reduce anger and hostility as well as the very human tendency to see others as “different” and therefore “less than” we are. Moreover, compassion work appears to be an effective component for treatment of both depression and borderline personality disorder (Allen & Knight, 2005). Goldberg and Crespo (2004) propose that to develop compassion, one must reduce one’s sense of righteousness, or obedience to the values and social norms of our own society. While we would never argue that one should deliberately violate one’s own values, an appreciation for the diversity of values in our own and other societies might make us pause a little before becoming too condemning of others without understanding the reasons and the cultural context for their beliefs. The second addition is a deliberate practice of forgiveness that can facilitate the development of compassion. There is an entire psychological literature on the effects of forgiveness and reconciliation (e.g., Kaminer et al., 2000). Ideally forgiving involves both an attitude change and an interpersonal action towards the offender. In genuine forgiveness, one who has suffered an injury chooses to abandon all rights to resentment and retaliation and instead offers compassion and mercy. It is voluntary and unconditional and does not depend on the offender’s response. When people forgive, they do three things; they feel empathy for the transgressor, they deliberately make more generous attributions and appraisals towards transgressor, and they cease ruminating about the transgression. The more people ruminate about an offense, the more difficulty they have forgiving the offense. Sometimes the person we most need to forgive is ourselves, for it is more difficult to forgive others if we cannot forgive ourselves. Self-forgiveness work may be especially helpful when dealing with anxious or depressed clients who magnify their responsibility for life events (Gilbert & Irons, 2005). There are several advantages to forgiveness. First, continuing to feel negative emotions may undermine one’s mental (and even physical) health. Anger can, in the short run, feel empowering but it is a fleeting empowerment. Second, a lack of forgiveness undermines all relationships and can result in one having few friends or intimates, while forgiveness promotes relationship harmony. Third, Forgiving is transformational rather than conservational. It changes one’s motivation from self-protection to self-enhancement, and changes one’s goal from avoiding pain to pursuing peace; peace of mind and peace with others. Clinicians must be aware that there are also some disadvantages to forgiving, and these may be a potential source of resistance. First, forgiveness involves relinquishing future claims for restitution; the offender no longer OWES the victim anything. In economic terms, it reduces the victim’s future resources. Therefore there are tangible and material benefits to holding grudges. Second, not forgiving can help people keep a sense of moral superiority (i.e., righteous indignation); forgiving renounces that. Third, not forgiving or holding a grudge means the victim can continually remind the perpetrator of the offense. Fourth, forgiving someone may hurt one’s pride or self-esteem and it may feel like accepting a loss of face. And fifth, forgiveness may be misinterpreted as weakness. The third addition is a deliberate practice of gratitude that can help in developing compassion. Gratitude may be seen as the surprise and wonder of ordinary things – and the sense of thankfulness that it exists and that you are a part of it. Gratitude has been shown to have several positive attributes. First, it supports a sense of personal well-being by displacing resentment, regret, and other negative psychological states. Second, grateful people experience higher levels of positive emotions – happiness, vitality, optimism, hope, and greater satisfaction from life (Adler & Fagley, 2005; Emmons & Crumpler, 2000). Third, people who experience gratitude are protected or buffered from the destructive impulses of excessive materialism as well as envy, resentment, disappointment, and greed. In other words, “It is best to want what you get, not to get what you want.” Yet most of the time we wish (or pray) for what we do not have and envy and resent other people who supposedly have more than we do and we tend not be grateful and thankful for what we do have. In psychological terms, we make upward social comparisons rather than downward social comparisons. Gratitude, like forgiveness, takes practice to do well. But like everything else, the more we practice something the easier and better it becomes. In this article we have examined the increasing influence of Buddhist teachings on Western cognitive psychotherapy within the context of the post-modernist, relativistic thinking patterns that may have resulted, at least in part, from the world-wide “clash of cultures.” We have identified specific themes of Buddhist philosophy such as mindfulness and compassion that already exist in cognitive psychotherapy, whether labeled as such or not, outlined particular forms of cognitive psychotherapy which emphasize these practices, and touched upon the clinical utility of these practices for particular disorders. In addition, we have described recent developments in cognitive psychotherapy that have incorporated these themes more explicitly. Finally, we have discussed how concepts such as compassion, forgiveness and gratitude can be further developed in cognitive psychotherapy. Based upon the recent proliferation of research studies regarding the benefits of incorporating Eastern practices into Western psychotherapy, as well as the creation of new aspects of cognitive psychotherapy which emphasize Buddhist philosophy such as ACT and MBCT, it is clear that the influence of Eastern philosophy on cognitive psychotherapy is here to stay and will continue to flourish. AA Services (2001). Alcoholics Anonymous – Big book (4th ed.). United States of America: Alcoholics Anonymous. Adler, M.G., & Fagley, N.S. (2005). Appreciation: Individual differences in finding value and meaning as a unique predictor of subjective well-being. Journal of Personality, 73, 79-114. Allen, N.B., & Knight, W.E.J. (2005). Mindfulness, compassion for self, and compassion for others: Implications for understanding the psychopathology and treatment of depression. In P. Gilbert (Ed.) Compassion: Conceptualizations, research, and use in psychotherapy (pp. 239-262). Sussex, UK: Routledge. Bach, P., & Hayes, S.C. (2002). The use of acceptance and commitment therapy to prevent the rehospitalization of psychotic patients: A randomized controlled trial. Journal of Consulting and Clinical Psychology, 70, 1129–1139. Baer, R.A. (2003). 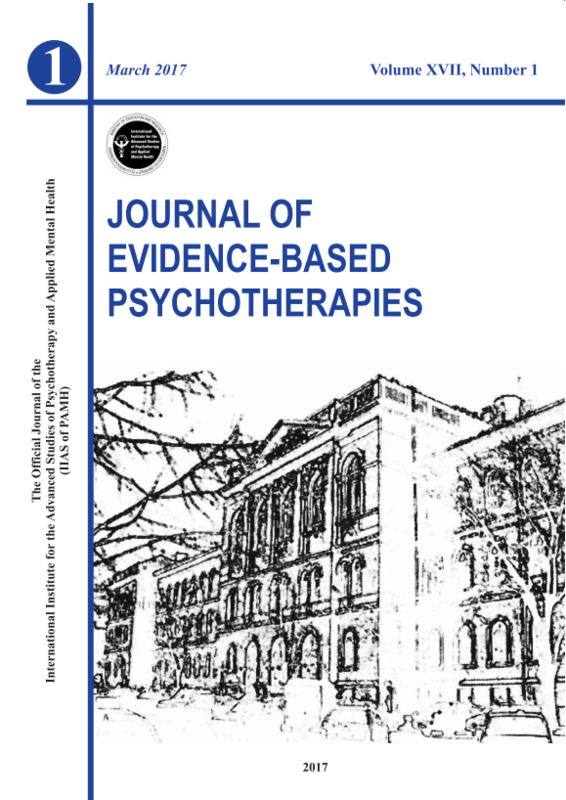 Mindfulness training as a clinical intervention: A conceptual and empirical review. Clinical Psychology: Science and Practice, 10, 125-143. Beck, A.T. (1999). Prisoners of hate: The cognitive basis of anger, hostility, and violence. New York: Harper Collins. Cushman, P. (1995). Constructing the self, constructing America: The cultural history of psychotherapy. Perseus Publishing. The Dalai Lama, & Cutler, H. (1998). The art of happiness. New York: Riverhead Books. David, D. (2003). Theoretical perspectives: Cognitive therapy in search of itself. Academy of Cognitive Therapy Newsletter. Dowd, E.T. (2000). Cognitive hypnotherapy. Livingston, NJ: Jason Aronson. Dowd, E.T. (2004). Cognition and the cognitive revolution in psychotherapy: Promises and advances. Journal of Clinical Psychology, 60, 415-428. Dowd, E.T. (2006). Cognitive hypnotherapy and the management of anger. In R.A. Chapman (Ed. ), The clinical use of hypnosis in cognitive behavior therapy (pp. 189-212). New York: Springer. Dowd, E.T., & Trutt, S.D. (1988). Paradoxical interventions in behavior modification. In M. Hersen, R.M. Eisler, & P.E. Miller (Eds. ), Progress in behavior modification (Vol.23), pp. 96-130). New York: Academic Press. Ellis, A., & Dryden, W. (1997). The practice of REBT (4th ed.). London: Free Association Books. Emmons, R.A., & Crumpler, A. (2000). Gratitude as a human strength: Appraising the evidence. Journal of Social & Clinical Psychology, 19, 56-69. Erikson, M.L., & Rossi, E. (1979). Hypnotherapy: An exploratory casebook. New York: Irvington Publishers. Frankl, V.E. (1975). Paradoxical intention and dereflection. Psychotherapy: Theory, Research & Practice, 12, 226-237. Fresco, D.M., Segal, Z.V., Buis, T., & Kennedy, S. (in press). Relationship of post-treatment decentering and cognitive reactivity to relapse in major depression. Journal of Consulting and Clinical Psychology. Fulton, P.R., & Siegel, R.D. (2005). Buddhist and Western psychology: Seeking common ground. In C.K. Germer, R.D. Siegel, & P.R. Fulton (Eds.) Mindfulness and psychotherapy (pp. 28-51). New York: Guilford Press. Gilbert, P. (1989). Human nature and suffering. Sussex: Lawrence Erlbaum Ltd.
Gilbert, P., & Irons, C. (2005). Focused therapies and compassionate mind training for shame and self-attacking. In P Gilbert (Ed.) Compassion: Conceptualizations, research and use in psychotherapy (pp.263-325). Sussex, UK: Routledge. Goldberg, C., & Crespo, V. (2004). Compassionate life: The moral crisis for psychotherapy and society. Westport, CT: Greenwood Publishing. Hardy, G., Shapiro, D., Stiles, W., & Barkham, M. (1998). When and why does cognitive-behavioural treatment appear more effective than psychodynamic-interpersonal treatment? Discussion of the findings from the Sheffield psychotherapy project. Journal of Mental Health, 7, 179-191. Hayes, S.C., Strosahl, K.D., & Wilson, K.G. (1999). Acceptance and commitment therapy: An experiential approach to behavior change. New York: Guilford Press. Hayes, S.C., Follette, V.M., & Linehan, M.M. (2004). Mindfulness and acceptance: Expanding the cognitive-behavioral tradition. New York: Guilford Press. Horvath, A. (2000). The therapeutic relationship: From transference to alliance. Journal of Clinical Psychology, 56, 163-173. Kaminer, D., Stein, D.J., Mbanga, I., & Zungu-Dirwayi, N. (2000). Forgiveness: Toward an integration of theoretical models. Psychiatry: Interpersonal & Biological Processes, 63, 344-357. Kohut, H. (1985). Self psychology and the humanities: Reflections on a new psychoanalytic approach. New York: W.W. Norton. Korzybski, A. (1933). Science and sanity: An introduction to non-Aristotelian systems and general semantics. New York: The Science Press Printing Company. Lynch, T.R., Chapman, A.L., Rosenthal, M.Z., Kuo, J.R., & Linehan, M.M. (2006). Mechanisms of change in dialectical behavior therapy: Theoretical and empirical observations. Journal of Clinical Psychology, 62, 459-480. Mahoney, M.J. (2003). Constructive psychotherapy: A practical guide. New York: Guilford. Martin, D.J., Garske, J.P., & Davis, M.K. (2000). Relation of the therapeutic alliance with outcome and other variables: A meta-analytic review. Journal of Consulting and Clinical Psychology, 68, 438-450. National Institute for Clinical Excellence. (2004). Depression: Management of depression in primary and secondary care. Clinical guideline 23. Retrieved February 27, 2007 from: http://www.nice.org.uk/guidance/CG23/niceguidance/pdf/English. Nhat Hanh, Thich (2001). Anger: Wisdom for cooling the flames. New York: Riverhead. Prochaska, J.O. & Norcross, J.C. (2003). Systems of psychotherapy (5th Ed.). Pacific Grove, CA: Brooks/Cole. Rogers, C. (1961). On becoming a person. New York: Houghton Mifflin. Segal, Z.V., Williams, J.M.G., & Teasdale, J.D. (2002). Mindfulness-based cognitive therapy for depression: A new approach to preventing relapse. New York: Guilford Press. Watzlawick, P., Weakland, J.H., & Fisch, R. (1974). Change: Principles of problem formation and problem resolution. New York: Norton.